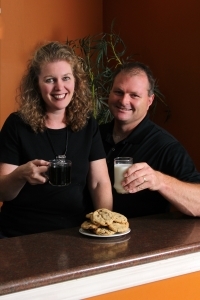 Since 2002 Mary and Rockey Dvorak have made from scratch gourmet chocolate chip cookies and presented their "can't have just one" cookie in keepsake gift canisters. Our mission is to provide you with a special way to show your customers, vendors, employees and friends how much you appreciate them by sending mouth watering chocolate chip cookies. Graduates of Kansas State University, Mary and Rockey have 50 years combined in the gifting and service industries. We appreciate all who allow us the opportunity to serve them. Thank you for your business!! !